Difference in marketing categories: Creative profiling provides a more in-depth comprehension of your customer. Target market is very broad, Niche is a broad group with similar interests and a Solo Profile fills in all the questions missing from the target market & niche. If you work on your own business or work for a company on the business side, I am sure you have ran into the words ‘target market’ or ‘niche’. These are actually quite important, yet it is one element I have noticed gets missed by business…. On the regular! I have been asking past clients, business minded individuals and fellow entrepreneurs if they do customer profiling…Almost every other person didn’t even have a clue what I was talking about. SCARY. Customer Profiling is a resource for businesses to help paint a portrait of who their customers are. Creating a few customer profiles can help with so many aspects of your business! Its so easy to fall into the ‘if i speak to everyone – then it applies to everyone!”. Unfortunately this could hinder growth and sales- One persons struggle is different then the others! Similar to point number 2, If you have a certain target market that primarily spends most of their time on one social media platform, why waste your time on one that has little to no traction? This is a big one. I regularly see small businesses trying to use EVERY single social media platform only to get burnt out and see no gain in all that effort. Start with 2-3 , and as you get bigger start to experiment with others. But really look at your data and statistics! There is a reason beard oil brands have red plaid, dark blue ‘masculine’ themed branding. It attracts men that may not think to invest in their beauty regime. Using customer profiling, you can use colors, textures and themes that your customers are obsessing over. Just because it is something you may like- may not be what your customers like! Ever had a great experience with your customer and wish they would come back for more? Or want to connect with more customers like that favourite customer? You can model some of your customer profiles to those customers! That way, when your working on your marketing materials, you can reassess how to get them back into your door and asking for more! 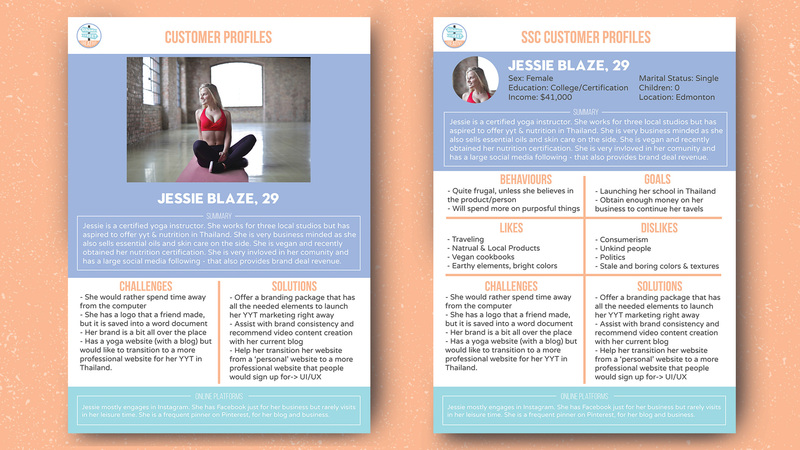 This is an example of two variations of customer profiles I use for Summer Street Creative. On the left is a very simple profile, and the right is a more in depth variation. I could go on for hours on why you should start customer profiling. I do suggest using it! Especially if your company has hit a slump or you are at the beginning stages of your business. Imagine – you have the tools to make sales right away just by breaking the barrier of not knowing who those customers are. Directly market to them and figure out where they hang out and watch that money come in! Ready to get to know your customers? With my Brand Strategy services I will help you in creating beautiful customer profiles that you can regularly use in your business! If you can’t invest in a brand strategy session at the moment, its alright! These are just some suggestions- just get you thinking and start profiling! Share and hit reply if you have applied this method to your own business strategy. I would love to hear!